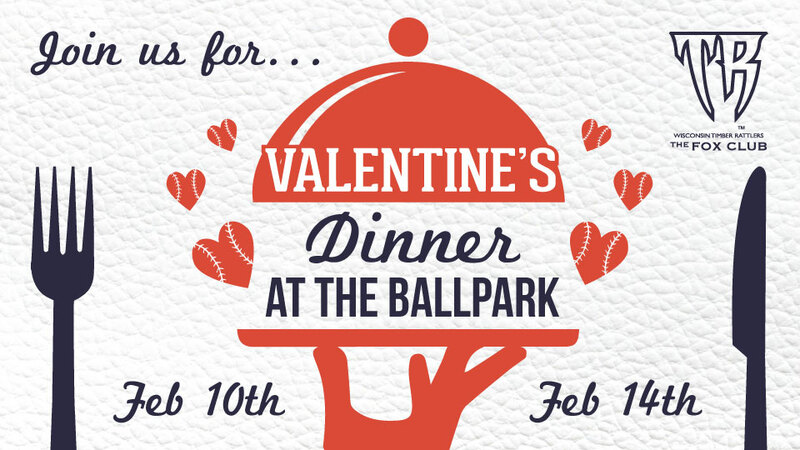 GRAND CHUTE, WI - The Wisconsin Timber Rattlers will open the Fox Communities Credit Union Fox Club at Neuroscience Group Field at Fox Cities Stadium for a pair of Valentine's dinners. The first dinner is to be served on Saturday, February 10 with another set for Wednesday, February 14. Space is limited for each night. Tickets are available now! There are two seating options available for each dinner. The first seating option is a candle-lit, four-course dinner for two in a private suite on the club level. This option includes a bottle of champagne or house wine, a long-stemmed red rose, a picture of the couple to commemorate the evening, a pair of 2018 ticket vouchers, and two chocolate-covered strawberries. There are just six suites available each night. The second seating option is a candle-lit, four-course dinner for two in the main banquet facility with a bottle of house wine or champagne, a long-stemmed red rose, a picture of the couple to commemorate the evening, and a pair of 2018 ticket vouchers. Space is limited to 37 couples for each night for this option. Double dates are allowed, but need to be specified at the time of purchase. Seating may be reserved in person at the Neuroscience Group Field Box Office. You may also order tickets by calling 800-WI-TIMBER or (920) 733-4152. The deadlines to order tickets for this event are Thursday, February 8 for the dinner on February 10 and Monday, February 12 for the dinner on February 14. Please let ticket office know which entrée you would like and if there are dietary restrictions when placing your order. All couples at the event will also have their names put on the videoboard at the ballpark during the evening. The private suite seating option is $160 per couple. The main banquet facility seating option is $130 per couple. Tax and gratuities are included in the price. The gates to the stadium will open at 5:00pm with the bar in The Fox Club open at the same time on both nights. Dinner will be served at 6:00pm on February 10 and at 6:30pm on February 14. The Timber Rattlers will begin the 2018 season at Beloit on Thursday, April 5. Wisconsin's home opener is Saturday, April 7 at 4:05pm against the Beloit Snappers. Full season, partial season, and group ticket packages are currently available for the 2018 season. Tickets packages are available online, over the phone at (920) 733-4152 or (800) WI-TIMBER and in person. Groups of 20 or more may order tickets over the phone or in person. Individual game tickets for the 2018 season go on sale Saturday, March 10. The Neuroscience Group Field at Fox Cities Stadium Box Office is open from 9:00 am until 5:00 pm Monday through Friday.